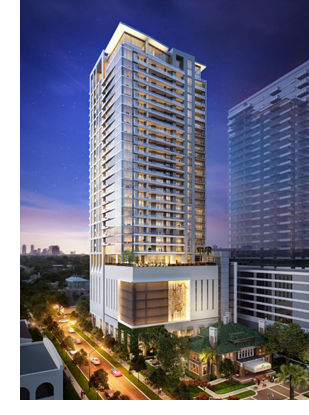 ​​​​​​ HOUSTON – Houston-based developer Hines’ has poured the foundation for its 34-story luxury apartments—the Residences at La Colombe d’Or. The property is set to open in first quarter 2020 and deliver by late 2020. The La Colombe d’Or, originally built in 1923 as the Fondren Mansion, is a boutique hotel owned by the Zimmerman family. The apartments, at the corner of Harold and Yoakum in Montrose, will be connected to the almost 100-year-old Texas landmark through outdoor green space. The developer has filed $68.5 million in building permits with the City of Houston for the project.